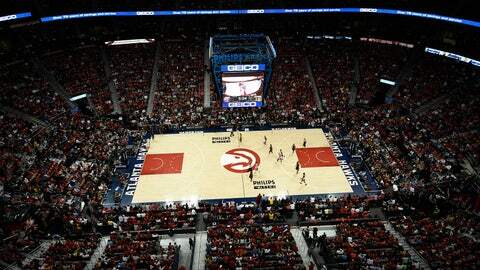 ATLANTA – The question followed the Atlanta Hawks from Philips Arena to Brooklyn to Washington D.C. to their final destination, Cleveland, at the beginning of this past summer. Where is the Hawks’ trademark rhythm? It became the ultimate litmus test of the postseason performance: If players and coaches were giving answers concerning the whereabouts of their ball movement and overall cohesiveness, the odds were good that Atlanta did not play well. The Hawks played poorly in their 2015-16 season opener, too, and it turns out that the litmus test still applies. In a 106-94 home loss to the Detroit Pistons, the new-look Hawks were out of sorts, and Paul Millsap was asked how long it might take to start clicking again. "Hopefully sooner than later," Millsap said. "With anything, if we had the same guys back, it’s going to take a little time to get back into a good rhythm with each other. … We’re a veteran group. We have a lot of guys that were here last year so we understand that we use these times to learn from them. We’ll use this game to learn. "Last year, started off stumbling. But we found our rhythm. We found our groove." A new season starts off, for the first time in the Mike Budenholzer Era, with high expectations and the added pressure that brings. Sequels to 60-win seasons rarely stick to the script. Since the 2000-01 season, only three teams have mirrored the effort with 60 or more wins the following year — the 2007 Mavericks, 2009 Celtics and 2010 Cavaliers. It’s happened just seven times in the past 25 seasons and Michael Jordan’s 1990s Bulls teams account for three instances. Modern-day dynasties (Lakers, Spurs, Heat) missed the mark. There is no slipping under the radar after that level of success. Roster turnover, injuries, worse luck … there’s a reason only five franchises have accomplished the feat in 25 years. Atlanta faces its own unique set of challenges, too. DILLARD: Is Paul Millsap still improving? Transition defined the Hawks’ offseason, with new ownership taking power and a new front office hierarchy taking shape. (Majority owner Tony Ressler and Grant Hill, the front-and-center faces of the franchise’s new ownership group, watched their team courtside on Tuesday night.) The roster’s architect, Danny Ferry, is gone, and while his handiwork remains largely intact, recapturing the franchise’s historic highs — even in shorter spurts — will be a challenge unto itself. Even the team’s aesthetic took dramatic, volt-green shifts. Budenholzer and general manager Wes Wilcox have added depth to a team that lost a starter for the first time in two seasons — DeMarre Carroll, the team’s most auspicious reclamation project, who followed major money to Toronto — but projected starters Kyle Korver and Thabo Sefolosha are easing into the season following offseason surgeries and, judging by Tuesday’s results, Budenholzer’s rotations are still a work in progress. To wit, the Hawks ran out 16 different lineup combinations and the starters played just 11 minutes together, posting a team-worst negative-13 in plus-minus. Not only was rookie wing Lamar Patterson a surprise addition to the active roster, he played 18 minutes and logged late fourth-quarter playing time. Tim Hardaway Jr., who the Hawks traded their first-round pick for, took Patterson’s spot on the inactive list. One-game sample size in mind, some 2014-15 weaknesses still appear to be present. The Pistons battered the Hawks on the boards behind 7-footer Andre Drummond, creating 23 extra possessions through offensive rebounding. Atlanta’s defensive rotations were off. When their ball movement stalled, or when outside shots were not falling, the Hawks’ offense looked disjointed at times. "We’re a team where ball movement and knowing guys’ tendencies, teammates’ tendencies, is such a huge part of what we do," Sefolosha said. "I think it’s going to take a little while to get adjusted." Detroit was simply the better team on Tuesday night. If it weren’t for the Pistons’ lackluster bench play, the final score would have been much worse. And that’s OK.
It’s not the triumphant return to Philips Arena the Hawks were hoping for — Atlanta lost just six home games last season — but they suffered their fair share of lopsided losses scattered across a dominant campaign. Remember the 30-point home loss to Milwaukee the day after Christmas? Remember hometown product Lou Williams catching fire to help the Raptors to a 25-point win in February? The Hawks were not immune to poor showings a year ago, and they will not be this season. The 82-game schedule doesn’t allow teams to consistently perform at their peak. "It’s one game. There’s things that we’re working on in practice that we’ve got to work harder on, got to do better," Budenholzer said. "I think every coach knows that — every team knows that there’s a lot to work on going into Game 1." The playoff run exposed some flaws — flaws the front office attempted to address, particularly with the addition of Tiago Splitter — and Game 1 of 82 was never meant to be the grandiose unveiling of a juggernaut. That’s not how this franchise is built. These things take time. As multiple players alluded to in the locker room after the game, last year’s 60-win team once held a 5-5 record with losses to two non-playoff opponents. Beyond the hype of a new era and new identity lies the far-less-glamorous bottom line: Sixty wins is going to be near-impossible for this group. The Eastern Conference looks deeper and healthier than last season with teams like the Heat and Pacers looking to push back into the playoff mix, and Atlanta can not plan on another 19-game surge to run away from the pack. However, there’s a chance that the Hawks take a significant step back in regular-season wins, but enter the postseason as a tougher out than they were last season. At least that’s their endgame. Losses like the one against Detroit are still in this team’s repertoire. If that was forgotten over the summer, the team sent a loud reminder on Tuesday. Still, Atlanta remains one of the East’s top teams, and Budenholzer & Co. didn’t construct this roster to win a one-game series. "They were very good tonight. We weren’t. That’s great," Budenholzer said. "We get to go to work tomorrow."